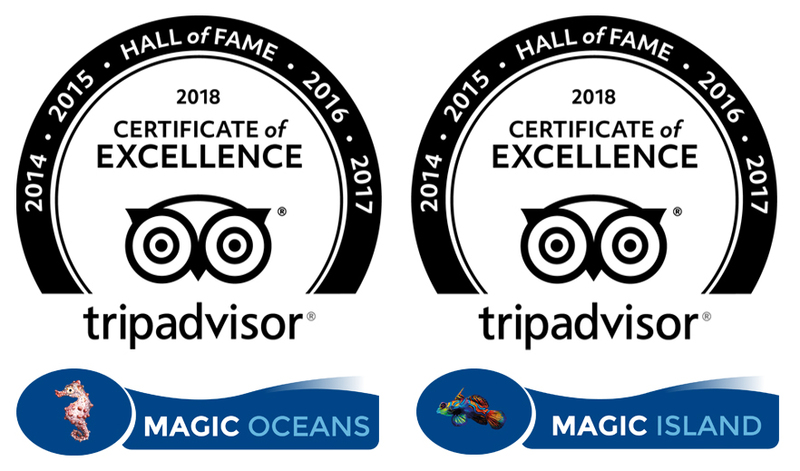 These incredible little sea slugs are one some the most sought after creatures for our divers and snorkelers here in Magic Oceans Dive Resort. They are known as Nudibranch, and here are a few astounding facts that you never knew about them. – Nudibranch (new-dih-brangk) comes from the Latin word nudus(naked) and Greek brankhia (gills) because their gills on their back are totally exposed without cover during their entire lives. – Nudibranchs are colorful little creatures from 6mm to 60cm and sometimes just called nudis by divers. They are soft bodied animals in the class Gastropoda, belly footed animals which leave a slimy trail. – More than 3000 species are known and there are new discoveries every day. Nudibranchs are very common worldwide, especially on the ocean floor, but some can swim short distances. – All nudis are sea slugs, but not all sea slugs are nudis. They are tiny but extraordinary, as Aeolid nudibranchs can use their cerata for defense and some kinds of nudi can excrete toxin or acid in their body if they are threatened. – Do not worry, because most nudis are harmless to humans and they have a short life span from less than a month to only a year. – They have a pair of tentacles called rhinophores on their head. This is a nose-bearer which can detect taste, touch, and smell food or other nudis. – There are two major types of nudibranch based on the location of their gills. 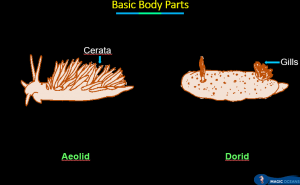 They are Dorid and Aeolid nudibranch. – Dorid nudibranchs breathe through gills that are located on their back. – Aeolid nudibranchs have cerata or finger-like horns on their back that functions as breathing, digestion, and defense apparatus. They also have variations of shapes; rose-like, club-shaped, clustered, thread-like, and branched. – Nudibranchs are hermaphrodites, meaning they have the reproductive organs of both sexes. It means both of them can be pregnant and lay up to a million eggs at one time. Eggs are laid in a spiral manner for a higher chance of survival. 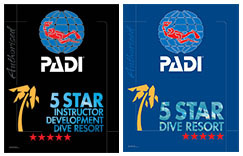 Come and dive with Magic Oceans Dive Resort and our dive guides will show you our nudibranchs paradise!